A checkin is the action of checking into a location and sharing that information. The term is often also used as a verb, to check in. Services like Foursquare, Gowalla (shutdown after being acquired by Facebook), Dodgeball (shutdown after being acquired by Google), Google Latitude (also shutdown by Google) are social community sites specifically designed for sharing checkins. The indieweb community is exploring how to post checkins to one's own website (likely privately), and how/when to syndicate (in POSSE style) such checkins to checkin-related community sites. If a high enough percentage of your friends use checkins, or view them, you can checkin to increase the chance of serendipitous meetups happening. 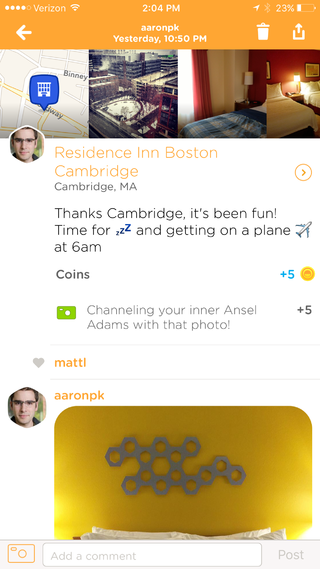 But to enable this use-case, checkins have to be really simple and unobtrusive, i.e. like the old Dodgeball txting UI was so simple that it made it very efficient to do so, so more people did so more often, thus enabling serendipity. I'm entering a specific venue, I'd like to quickly/automatically capture the fact that I'm entering that venue (similarly for exiting) for personal logging / quantified self purposes. Personal tracking could be done purely with private posts, however, friends-only checkin posts, without any expectation of anyone showing up, serve the purpose of also letting friends know where you are (and thus providing a feeling of being implicitly connected, even if mediated through such an indirect means). I'm visiting a city other than my home town, and rather than try to figure out who I know may be in that town at the moment and compile far too many explicit messages or a long BCC email, I'd like to announce to my friends who happen to also be in that city that I've arrived there and will be around a bit in case they'd like to meet up. I'm out at a coffee shop and want to quickly see if any friends are are nearby and might interested in getting brunch/lunch/dinner/drinks together. I've just arrived at a busy place/event, and I want to see if other people I think are coming have arrived yet so I know whether to look out for them. I want my local coffee shop to see I'm their best customer. I want my boss to see I'm always in the office. I want people to see I regularly help out at the local children's hospital. I want to see who else is here before I go in, so I can avoid people I don't want to see. I want to tell the world I'm somewhere I'm not. home. Frequent checkins at home can be annoying to your friends that see your checkins. work. Similarly, if you mostly checkin to work at the same time every day, that too can be annoying to your friends. (from personal experience with early Dodgeball usage). privacy. Some people won't checkin to maintain privacy or are worried about potential stalkers and/or harassment. Checkin after the fact may be a potential solution. See also postsquare. Most consumers of checkins will ignore the name of the h-entry, so that is really only there for fallback for consumers that don't recognize the checkin property. What are best approaches to POSSEing checkins? Ben Werdmüller POSSEs his checkins to Foursquare with Known. Ryan Barrett currently manually POSSEs from his site to Facebook, manually picks the venue etc. Can likely call Facebook API to get a list of venues at a geo location. Could also create a Bridgy Publish feature that looked checkin post with a Facebook venue URL and then POSSE the checkin to FB. For those not using POSSE yet. Felix Schwenzel modified OwnYourGram by Aaron Parecki to allow PESOS of checkin on Foursquare (really Swarm) via micropub using OwnYourCheckin. OwnYourSwarm, also by Aaron Parecki, PESOSes your Swarm check-ins, photos, and "with..." person-tags to your own site via micropub. Dan Q has implemented a plugin which streamlines PESOS of geocaching logs from the dominant silos (e.g. Geocaching.com) into WordPress. added support for checkins to actual (permalinked) venues on 2014-10-26. Ryan Barrett is using WordPress with his own modifications to post checkins since 2014-11-13, usually PESOSed via ownyourcheckin, occasionally manually POSSEd to Facebook, e.g. Note 1: We haven't specified how to check-in at an event (something Swarm lets you do at some venues, like movie theaters), so this is an interesting prototype to further analyze. same as checkin with a person, both people are marked up as h-cards inside the h-as-checkin. Chris Aldrich began owning his checkins on 2015-02-15 using Known while also syndicating to Foursquare. On 2016-04-03 he began owning his checkins using micropub to his WordPress site using OwnYourCheckin and WordPress Post Kinds. Ryan Rix (rrix) can post checkins from Arcology] since 2016-04-13 by creating a post with the CHECKIN tag on it and then calling a function `arcology-checkin-get-venue-id' which calls out to the Foursquare API to pull and cache the information for a venue. Martijn van der Ven posted his first checkin during HWC 2016-12-14 based on a discussion of the format on IRC. Sebastiaan Andeweg also posted a checkin during HWC 2016-12-14, from the same venue as Martijn van der Ven. His CMS recognises the 'checkin' field now and renders it as a p-checkin.h-card with .p-name and .u-url. No real posting UI or venues yet. 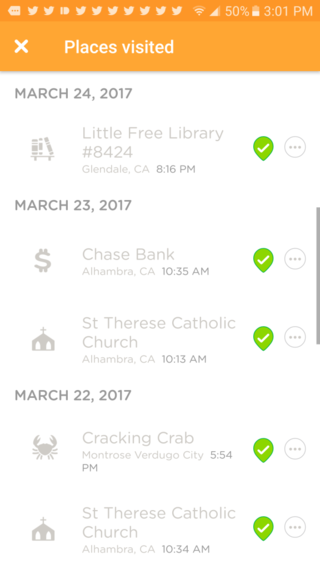 2017-05-19: changed my storage of checkins to a full embedded h-card (instead of just a name and url field) to support OwnYourSwarm, to use Swarm/Foursquare's posting UI and venues. Aaron Parecki added support for posting checkins using p3k on 2017-03-18. Barry Frost posted his first checkin via Micropublish on 2017-03-15 to his Transformative site. He then used OwnYourSwarm to post his second checkin on 2017-03-20. Eddie Hinkle added support for posting checkins using abode on 2017-04-21. This is powered by using OwnYourSwarm, and He is importing previous Swarm posts as well. Ravi Sagar is using Drupal site to post notes with location. Not yet using the h-card format though. Also using another Known site http://www.sagar.ravi.pro and evaluating how checkins can be sent to Foursquare and vice versa. Some folks have experiments or prototypes of posts resembling or approximating checkins but are lacking key information in some way, e.g. explicitly marked up location information. These posts are notes that show how a checkin could be presented in plain-text form, i.e. how a full checkin post could be POSSEd to Twitter, based on how Swarm cross-posts checkins to Twitter. Note how the Twitter copies have a permashortlink after their text content that links to the respective Swarm posts. 2012-181 OSBridge BarCamp Day: Foursquare is down! Let's figure out IndieWeb Checkins! Pretty good notes in there that could be abstracted and captured in general form in new sections here. More explorations/brainstorms than FAQ yet. Is a checkin actually a separate post type? Or is it just a note with location information? Or does a note with location information become a checkin only when the location is a specific venue? posting a note on Twitter with location information? The posts page has some discussion about the general question about explicit vs. implicit post kinds. More ideas than creations, some thoughts about how individual indieweb community folks want to do indieweb checkins. Experience with Foursquare's "community generated/patrolled venues database" is that a few nitwits can pollute/damage the data quite badly, with deletions, overmergings etc. Sad to say, same thing happens with Wikipedia (excessive deletions, overmergings). Thus little hope that a "community hosted venues database" wouldn't have all the same problems, if not worse. Just use hCard on indieweb venue URLs. In general it is good to use multiple source of geolocation information in order to increase accuracy and decrease latency to provide this information when querying for and presenting (multi-factor prompts) nearby venues. GPS is great. Except when you are inside a building - it doesn't work. Then you go and get on the Tube, and pop out the other side. It takes time for GPS to seek. You spend much more time waiting for GPS to work out where you are than you do just typing in the name of the bar or whatnot. wifi-assisted location determination can do better than GPS when inside a building. Last time(s) you checked in (or GPS was detected), you were moving in this direction at this pace, therefore you're likely at this location now. The last n times you checked in at place A, you checked in at place B within the next thirty minutes. You just checked in with friend F at location A, your friend F just checked in at location B, therefore you might be at location B as well. Like other types of posts (e.g. likes), it makes sense to figure out a plain text design for checkins, for various contexts. Foursquare provides a plaintext version of checkins when viewing a user's history page. Ryan Barrett's page of checkins: https://snarfed.org/?s=checked shows a plain text equivalent (summary) for each individual checkin, e.g. "Checked into Pleasanton Ridge Regional Park with Vanessa Barrett and Richard Barrett." Use-case: wanting to checkin to a location without (good?) connectivity. special case of "async" checkins? Tantek Çelik I will often take a photo at a location where I want to checkin but lack connectivity (yet somehow the photo gets close-enough location info from SSID triangulation etc. ), and then later use Instagram to post the photo with an explicit venue and cross-post from there to Swarm to do a "Postsquare" checkin. Problem: Instagram's venues database (since 2014?) is based on Facebook's venues which is of very poor quality in comparison to Foursquare/Swarm’s venue database. Aaron Parecki: If checkins weren't posted on Foursquare, but instead were posted on each person's own website, the possibility of fake checkins is much greater. Tantek Çelik: I disagree with this premise and expect the opposite is true based on existing silo vs indie posting. People post all kinds of lower quality (e.g. sometimes fake) content on silos, and when the same people start posting to their own site, typically the quality improves, perhaps because they feel their identity is more (publicly) tied to it, or for private posts, why bother lying to yourself on your own site? With checkins I would expect the same, higher quality checkins (fewer fakes) on a personal site than a silo. Aaron Parecki: The venue's TV screen always displays a 4-digit code and instructs people to include that code in their checkin post on their website. Tantek Çelik: The extra 4-digit code thing sounds like "work", and as a user I'd always just blow it off, or blow off anything that required it, unless there was a very good incentive to bother with it (e.g. coupon / discount at the venue). Concrete example of the 4 digit code laziness problem. Coffee Bean & Tea Leaf (California based coffee / cafe chain) used to have a 4 digit code on their TVs for logging into their captive portal for their free wifi. They eventually got rid of it. 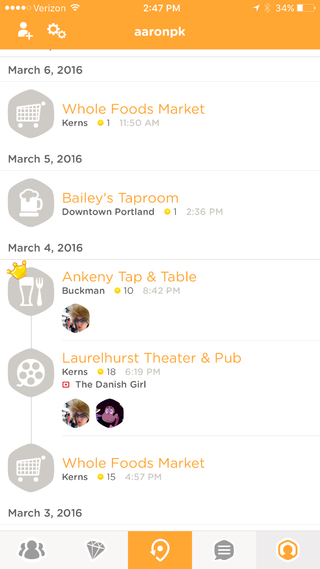 Swarm provides a feature that allows users to check in for an event while checking in to a location. Venue managers add events to a schedule. 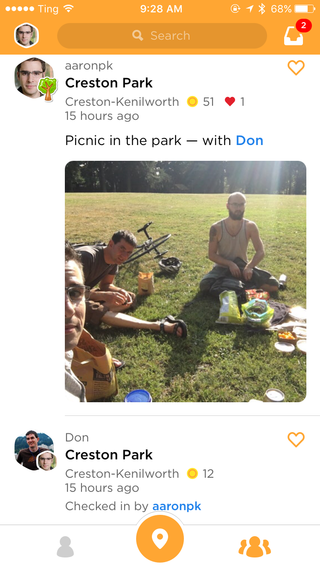 When a user checks in during the time of the event, Swarm prompts the user to also check in for that event after choosing the venue. The checkin on Swarm and Foursquare shows the venue as well as the event name in the checkin. How should this be displayed and represented on an indieweb site? The following ideas were iterated on, perhaps even in the wild, but have been abandoned for various reasons. As a result of a brainstorming session about ActivityStreams and microformats at the 2012 Federated Social Web Summit in San Francisco there was a proposal to use h-as-* prefixed (sub)types for posts as a way of representing ActivityStreams post types explicitly in microformats. One of those was h-as-checkin. As use of explicit post types have been gradually abandoned in various UIs (being replaced by generic posts with any number of user-optional properties), the use of explicit types in markup has similarly been abandoned (UI leading/driving the plumbing as it were), including h-as-checkin. post type discovery shows some current thinking regarding post types. Bottom line: Avoid using h-as-checkin. 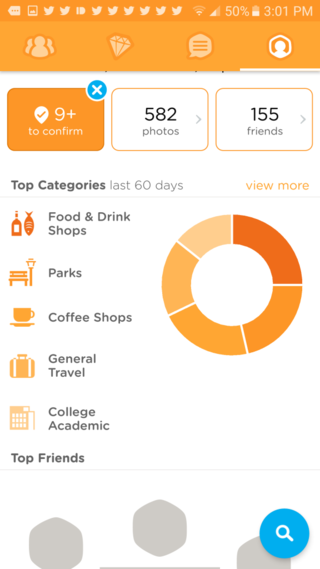 Swarm, formerly Foursquare and still made by the company by that name, is a popular checkin client. Swarm has a single "post" button in the middle of the row of buttons at the bottom of the default homescreen iOS dsiplay that looks like a map drop pin where the outline of the pin has a small arrow on the lower left side. 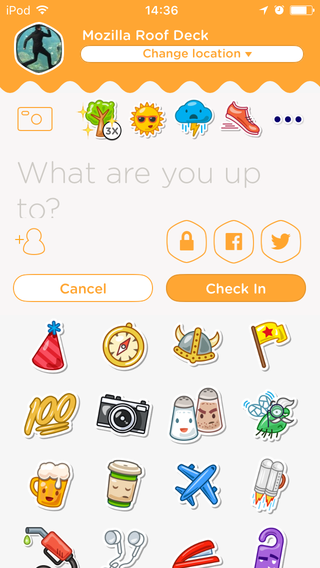 series of four "badge" or "sticker" icons you can choose from (or tap again to toggle off), some of which apply multipliers to your check-in points, with a "…" ellipsis to open up a menu of more stickers to choose from. 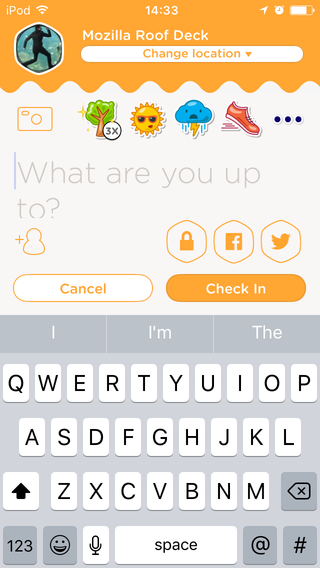 auto-focused text field to enter a checkin note, prompted with the default text "What are you up to?" 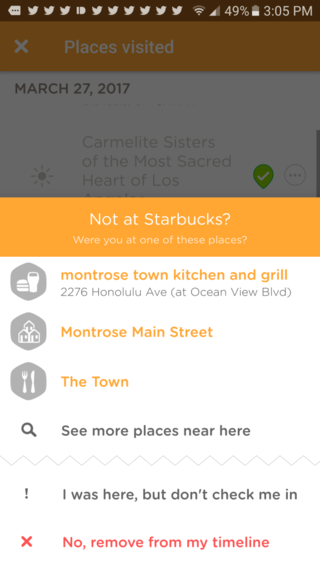 Swarm will occasionally provide notifications in its mobile app to remind you to checkin at places you may have previously missed. This functionality can also be accessed from the user's profile screen typically with the label "#+ to confirm" where the # is the number of locations not checked in at. The list of places visited can be either accepted by clicking on the green location pin icon or the ... "more" indicator can be chosen to modify the location of the checkin; indicate one was there, but not be checked in; or remove the item from one's timeline. 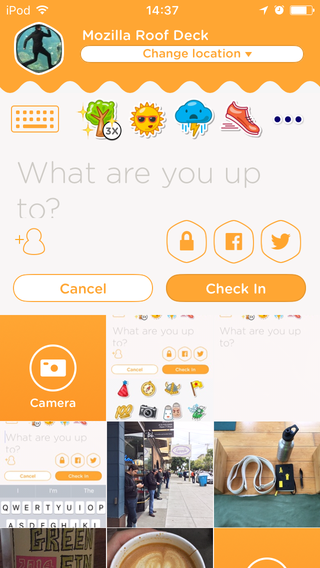 Swarm allows you to check in your friends if they've enabled the feature. When you tag someone in your checkin, a new checkin on their account is created. This is a separate post from your post. 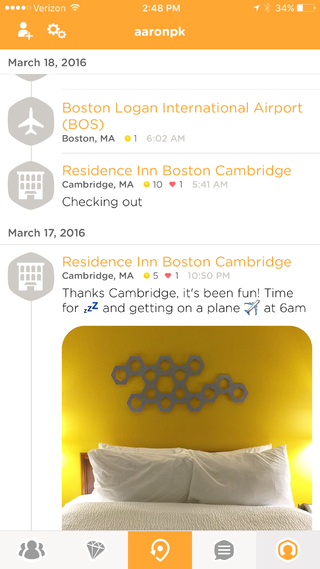 When you check in to a place where you have been checked in by a friend, the post gets updated with the text, photo's and sticker you chose. Geocaching.com and other geocaching silos allow players to publish checkins to locations (which can usually be independently verified by the signing of a logbook at those coordinates, or in the case of some silos by acquiring a password from that logbook). Silos that support checkins (checkin silos) that have either gone away (site-deaths), or dropped checkin as a feature. Brightkite was a checkin silo. Fire Eagle was a checkin silo created by the Yahoo! Brickhouse team in August 2008. It stored a user's location and shared it with other authorized services and inspired other future location services. A user could authorize other services and applications to update or access data via API, allowing a user to update their location once and then use it on any Fire Eagle enabled-website. The intention of Fire Eagle was to serve as a central broker for location data. Services which supported Fire Eagle included Pownce, Dopplr, Brightkite and Moveable Type. It was one of the first sites to use the OAuth protocol to connect services together. The service closed circa February 2013. Gowalla was a checkin silo. Dodegeball was one of the earliest popular checkin silos (if not the first?). It was acquired by Google in 2005 and shut down in 2009 being replaced by Google Latitude. This page was last edited on 5 March 2019, at 14:59.